After studying Spanish in junior high, my family moved into a district that didn't offer foreign language until my junior year. While I enjoyed my middle school experience, I had lost interest by the time I had a second opportunity and ended up graduating high school with zero foreign language study. As an engineering major, I didn't take a foreign language in college either. However, I feel that it is very important to study another language, or several languages. Yet here I am, a homeschooling mom, with zero background in a foreign language. Furthermore, I complicated things by deciding my children should start by studying Latin, not only to get them the foundation for the study of other languages, but to understand their own as well. Studying Latin isn't always the most popular choice, as evidenced by the quizzical looks from people when my oldest mentions she's studying Latin and my father's more direct response of, "WHY?" when I told him the direction we were going. As a result, local resources are more limited than they might be for other languages. I realized I either needed to find a program that would allow me to learn along with my student or outsource it completely. I toyed around with thoughts of the various programs for homeschoolers out there, then quickly decided this was one area that I would outsource. I'll admit, I was a bit of a coward to try it. I share all this background with you so that you can understand my perspective of my latest review product, The Great Latin Adventure by Katharine Birkett. When I found out that I would be receiving Level I and Level II of this Christian Latin program for grades 4th - 6th, I was both excited and nervous. While I have zero background in Latin, my daughter has had two full years of high school Latin with an outside teacher. I also have a rising 6th grader with very little Latin experience. The Great Latin Adventure is the result of a 10-year development, complete with plenty of field testing. Katharine Birkett, a Princeton graduate with a degree in Russian and literature who also has experience teaching Latin in a school setting, certainly made sure the program was carefully edited, revised, and tested before putting it on the market. This lengthy development contributed to meeting part of the vision of Katharine and Norman Birkett's for curriculum published by their company, Classical Legacy Press. Our commitment in writing curriculum materials is to set the bar high, and then help students achieve it. Subjects don't need to be "dumbed down" in order to be enjoyable and attainable; our programs feature an orderly topic sequence and a friendly, accessible style which enable students to achieve real skill in Latin and logic—in manageable increments. Each level comes with a Teacher's Manual, a Student Book, and a Pronunciation CD. Both the teacher and student materials are 3-hole punched and ready to put in a binder. Materials also come with a one-page Getting Started instruction sheet. New users are directed to the Master Chapter Plan (MCP) which follows a 12-page introduction in the Teacher's Manual. The MCP is 15 pages of explanation on the chapter types, the unit organization, lesson-planning information, and pointers for using the curriculum. Between the the introduction and MCP, a very good overview of the program and how to use it is given. I'll admit, it was bit overwhelming for me to take it all in at once. Once I took a better look at the individual chapters, however, it pulled together in my mind a bit better. I tend to have a whole-to-parts approach to most things, so I advise you don't let the initial information intimidate you until you see how it is implemented. Level I has 12 chapters and Level II has 13 chapters. The schedule suggests taking about 3 weeks per chapter on average. See the below links for a Table of Contents for each level. The Great Latin Adventure uses classical pronunciation, which is covered in the first chapter of Level I. However, those wanting to use or already using ecclesiastical pronunciation are advised to just skip the first chapter. While the lessons assume a classical pronunciation, the author does give tips to successfully use the program if you prefer ecclesiastical. I found the Teacher's Manual and Student Book very organized, right down to how the student pages are numbered to account for the addition of completed quizzes in each chapter. The grammar lesson and worksheets, with answers, are organized identically in the Teacher's Manual as they are in the Student Book with the addition of both blank and compete-with-answers pre-quiz and quiz for each chapter. The Teacher's Manual also includes very detailed Teaching Notes for each chapter. The Teaching Notes give a teacher with no Latin background very important guidance, while still providing valuable tips to the more experienced teacher. Katharine Birkett is obviously a very logical and detail-oriented person. For teachers without a Latin background, her Teacher Notes are invaluable. She covers everything, right down to suggestions on how to make and use flash cards, in a very approachable narrative writing style. Whether using this curriculum in a classroom, co-op, in a tutorial situation, with the same age students, or multiple students, Birkett addresses various ways to successfully use the curriculum. Having no background in Latin, this support made me feel as though I could indeed learn the language right along with my child. Great Latin Adventure is worksheet based, has a derivative focus, and is very through and complete. One thing I really appreciate about this program is that it is predictably structured. And though it is structured, the author takes great care in giving suggestions for using and modifying the curriculum for a variety of situations. The general structure of each chapter includes material in the following order: vocabulary list, grammar lesson, study sheet, derivative worksheet, translation worksheets, pre-quiz, and quiz. The new material for each lesson is covered in a variety of ways without being too repetitious for the age group intended. After several Latin-to-English chapters, an English-to-Latin review chapter is covered. You will find sample pages of the various types of material in each chapter for both Latin-to-English and English-to-Latin chapters at the website here. Jesus says we should not invoke God's help with meaningless repetition of our prayers. It's not effeminate for a man to appreciate color and beauty. The head craftsmen who made the tabernacle beautiful were men specially gifted by the Spirit of God. In America we can worship as we choose. That's a good reason for patriotism. Many in other lands do not have this freedom. The Derivative Worksheets are both interesting and unique. I would not suggest leaving them out. However, if you are worried about content that doesn't not align with your beliefs, a quick read-through should suffice. The majority of the content will not pose any issues. Having no Latin experience myself, the level of content was a bit harder for me to determine. My initial impression was that it is a rather rigorous middle school course that would prepare students very well for Latin study at the high school level. When I looked at the content, I determined that it aimed too high for my rising sixth grader, who is dyslexic and struggles in the language arts area. He doesn't have the grammar foundation needed yet, but it might be a better fit for him in a year or so. To determine readiness for The Great Latin Adventure, please read When should my child begin? The Great Latin Adventure probably would have been just about right for my older child, who has opposite strengths as my younger child and jumped into a high school Latin course as a 6th grader with no experience, when she was about 3rd or 4th grade. Having just completed her second year of high school Latin, I had her browse through the Level II for an idea of coverage of both levels. She thought the lessons were explained very clearly. None of the content was new, though that was expected given her previous study. She also found topics in the Level II that were covered toward the end of her first year of study. Overall, she thought this would have been a very good preparatory course for middle schoolers. This program would work very well in a classroom setting. I think co-op teachers would love the structure and support. Those with minimal Latin background would have the necessary support to run the class while enough support information is provided for those with a Latin background to better present their expertise in the classroom. I don't want to minimize that this program would work equally well in the home, either with one child or multiple children. Now that I've covered what the curriculum is, let me cover briefly what it is not. This is not a self-teaching program. You can't just hand the Student Book to your student and be done with it. If you don't have a Latin background, you will need to learn it right along with your child to have success with the program. It is also not an open-and-go program. Each chapter has about 5-8 pages of teacher notes to cover plus the time needed to learn the new material (if you do not know if already) for the chapter. And while it is worksheet based and does not come with teaching DVDs, I would not consider it dry. Katherine Birkett does a decent job of keeping interest level high. There is much I have not covered, and I do recommend you look over the FAQ to explore further. Overall, I found this program a very approachable, very organized, and very thorough late elementary and middle school Latin curriculum. While I find learning Latin to teach it a bit intimidating, I left my review of this product feeling like I could very well have success in doing so. If you are in the market for a Latin curriculum for a 4th -6th grader (or slightly older or younger), then I highly recommend that you give The Great Latin Adventure a look. Each level of the Teacher's Manual sells for $30 and each level of the Student Book sells for $15. Classical Legacy Press stands by their products and offers a full refund within 60 days of purchase if you are not fully satisfied. Read more TOS Crew reviews on this product here. I just wanted to give a quick update on MathScore, a product I reviewed back in January. You can read my thoughts here. This is one of those programs that the more you use it, the more both parent and student like it. I was blown away when my son, who had been claiming he was starving (usually a tactic to get out of schoolwork) told me he wanted to finish up his Mathscore task before coming to the table because he was about to earn some points. I wasn't sure how motivating the program would continue to be over time. However, the point and trophy system seems to work well. I absolutely love the detailed parent report. My son's work has been rather unfocused lately. Unfortunately, I have been extremely busy and haven't able to check up on him as much as I would like. I just ran a parent report, with specified dates, that details the engaged time versus time at the computer while signed in at the program. Very enlightening. While he has been working on quality worksheets, his engaged time has been decreasing the warmer and sunnier it has gotten outside! He was much more focused in the winter months. While this isn't exactly a good thing to see on a report, it shows me perhaps that it would be better to have him work on the program in the morning like we used to, rather than the afternoon when he's definitely ready to get outside to play. Overall, I continue to be happy with this program and still use it regularly. My daughter has not used it much yet, but will this summer, which is going to involve some catch-up math work and review. I'll report in after the new school year begins with her feedback on how Mathscore helped her brush up on her math skills. 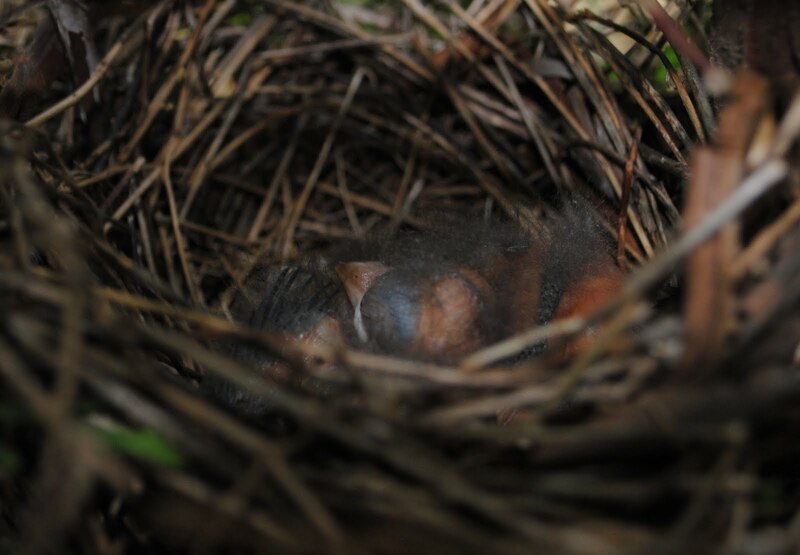 Wordless Wednesday: New Spring Cardinals! Handwriting has been a large issue in our household. My son avoids writing as much as he can. It has provided for some great mental math exercises, simply because he doesn't want to write down the problems, but it hasn't helped much with legible writing. I know boys tend to not have beautiful handwriting, but, really, my standards are pretty low. My first criteria is that he can read his own writing (yes, this is a problem). My second criteria is that I can read it. Lastly, it would be really nice if others could read it too. Last year, I started to give up hope and decided I was going to focus more on keyboarding skills. Then, a few months into the year, I was given an opportunity to review Peterson Directed Handwriting. I figured it certainly couldn't hurt the situation, and readily agreed. You can read the resulting review here. In that review I cover details on the Peterson method, which I won't overlap in this review. Please hop on over to read the first review if you are unfamiliar with Peterson Directed Handwriting. We had just completed the Grade Three Homeschool Kit this year when I found out that Peterson had some new products to review. Perfect timing! In response to requests, Peterson has made available lesson e-workbooks for all levels of their program. During this effort to make the e-workbooks available, the idea for a handwriting software tool, PDF By Hand, was conceived. I was really curious on how using a computer for handwriting skills would work in our home and agreed to give PDF By Hand a try. PDF By Hand is designed to be used with a Wacom tablet. The software is available alone or preloaded with e-workbooks. There are three pre-loaded options: print, cursive, or full version. I received the cursive package. PDF By Hand Cursive includes all levels of cursive writing, from kindergarten to adult. It is preloaded with six e-workbooks, which are also available individually. Click on the titles below to read a description of each e-workbook. You may also view the entire e-workbook in a non-printable version by clicking on the links in the parentheses. Also included are two files that allow the user to create handwritten notes and pictures. The individual license covers use of the software by students in the same household. With digital products, I'm always concerned with losing the program to a computer crash. Peterson Directed will provide you with another download in the event of a computer crash or a new computer purchase. The license also allows you to install on more than one computer in your home. Just ask and they are happy to help. Any of the document pages can be printed for paper and pencil practice or used with the PDF By Hand software on the computer screen. There are two options for computer work, mouse/finger mode or tablet mode. The mouse/finger mode is intended to practice large movement either with a mouse, or more ideally with the finger on a touch pad. (Finger tracing is one of the steps of the Peterson method that it utilized before the student actually picks up a pencil and writes.) With a tablet, the parent will hold down the button that functions as the left mouse button while the child uses a finger to write on the screen with the touch pad. The tablet function uses the tablet pen on the tablet surface. By doing so, the student can write directly on to the worksheet displayed on the computer screen. Work done on the computer can be saved as an individual PDF file for storage or sharing. Why use the computer to practice handwriting? You are probably wondering what are the advantages of practicing handwriting digitally. For those into "green", it certainly saves paper. I also like that practice pages can be saved as individual files and opened up by anyone with Adobe. Additionally, a digital record of progress for reference is easily stored on your computer as a PDF document. Using the computer also adds a bit of variety in handwriting practice, which usually does not rank high in our household. The ability to increase the size of pages by zooming in and out helps adjust that pages as the child gains more pencil control. There are also options to change pen color and line thickness. Using the software for practice provides an added challenge of movement control. Anyone that has used a tablet before will know that it takes some getting used to seeing the results of your hand movement someplace other than the paper. It requires visual attention on the screen, while directing movement of the hand. How did it work at our house? My experience was a bit unique because I originally tried out the software not with a tablet, but with a digital pen. My pen is actually an inking pen, that is read by a sensor that clips to the top of the paper. In order for it to work with the software, I needed to run it in finger/mouse mode rather than tablet mode. This system actually worked fairly well, but it did have some glitches. While fairly smooth most of the time, it was a bit inconsistent running in mouse mode, which doesn't provide as precise feedback as tablet mode. The other issue is that because it actually inked on the paper, my son would get the visual feedback on the paper as well as the computer screen, rather than relying on muscle control and memory for his movements. I ended up buying a tablet, partly because I always wanted one and partly because I knew we would get better use of the software. The tablet had a much smoother response and in general worked much better. However, I did find one very distinct advantage to using the digital pen described earlier. With the pen, I was able to hold the pen just above the paper and truly air write the letters with the results showing on the screen. It certainly wasn't enough of an advantage to stick with the digital pen over the tablet, especially since my son is beyond the air writing stage, but worth mentioning if you have both tools available to you. For overall use, I recommend using the software with a tablet, as designed. I found using the computer for practice is much harder than I thought it would be and my son had some difficulty. However, when he did have some success, it made it all the more rewarding. ("Look how nice that one looks, Mom!") Part of the advantage is it really makes one think about the movement. It is sort of like writing with your eyes closed...are the letters so ingrained that you don't need to think about movement? We'll continue doing paper and pencil work as well, but the computer work is certainly worthwhile in handwriting training and adds a bit of variety. "In the other program, the letters were loopy and I just kept going and going. With Peterson, it slows me down and makes me think about each step." The first thing I noticed after starting Peterson Directed Handwriting last year is my son's letter spacing dramatically improved when printing. His writing used to be just a string of letters and the reader had to figure out where a word started and ended. My son is still not fluent enough to write in cursive outside of practice, but his print writing is now legible and his cursive is improving. We no longer have tears during writing practice either. I have him work for 10 minutes and we are done for the day. I always look for multi-functionality of products and PDF By Hand is no exception. The software itself goes beyond just a handwriting practice tool. I have a ton of e-books and workbooks on my computer from a variety of sources. I realized that I could pull up the vast majority of these files in PDF By Hand and use the tablet to write on them. That means that the math worksheet that normally requires printing can actually be worked out on screen with the tablet, then digitally saved as a completed worksheet as a PDF file! Have an e-book or paper that you'd like to annotate? Perhaps you'd like your student to circle words that they don't understand? This is now possible by pulling the file up in PDF By Hand and marking the text with the tablet pen. I discovered that not all PDF files were viewable as some have security features, but many were. You are also able to make your own worksheets by saving a file you create in a PDF format. Use the same worksheet for multiple children and save their answers without printing a single page. Worth mentioning is the excellent customer service. The website is filled with a ton of information on the program. The following three pages are good places to start. Rand Nelson, also known as Mr. Pencil, is available to give advice and answer questions. You are able to meet with him live in an online meeting room to discuss your handwriting needs. The PDF By Hand Cursive is available for $75 for an individual license. This is a fabulous buy considering that purchasing just the preloaded workbooks alone costs over $100. Purchasing the e-workbooks as a package with the software gives you not only a hefty discount on the e-workbooks but provides the software as well. If you would like to purchase just the PDF By Hand software, without any workbooks, it is available for $29.95. Print, full (cursive and print) and Building Licenses (for schools) are also available. If you are planning to use the e-workbooks and just starting out with this program, purchasing the program as a package with the PDF By Hand is the definite way to go for cost effectiveness. While we had mixed results with noticeable handwriting improvement as a direct result of using PDF By Hand during our short-term use, I like the challenge, versatility, and variety that the software provides to the handwriting instruction in our home. We'll continue to use a mixture of printed worksheets and computer screen work. Visit the Peterson Directed Handwriting website for more information, to make a purchase, or discuss your needs in an online meeting room with Rand Nelson. Fellow Crew member, Laura O at Day By Day in Our World, also reviewed the new PDF By Hand software. You can read her review here. Most of the other Crew members for this product reviewed the e-workbooks, which can be read here. Have you ever bought an item, whether for your homeschool or just your home, only to have a friend find out and say, "I wish I had known you were looking for that. I have one that you could have borrowed." It has happened to me on more than one occasion. I often borrow and loan items to friends, but I don't always know what goodies they have available. Wouldn't it be nice to search the inventories of your friends virtually? Lobster Network is a new one-of-a-kind internet tool that helps communities buy, sell, trade, or give away items. It can also be used as a way to a personal inventory management. Essentially, it takes the concepts of popular sites like Craig's List, Paperback Swap, and eBay, and combines them into one tool. Why is it called Lobster Network? I initially wondered too! While I love a nice lobster dinner, the name of this review item has nothing to do with food. The name Lobster Network is an acronym reflecting the versatility of the tool. Signing up is easy... and FREE! Once you are registered, you have several options for adding your items. The system is categorized for easier browsing. The listings currently available are: Audio, Household Items, Print, Video, Video Games, Other. You can list your items under a personal inventory, visible only to you. Or, you can have your items visible to others as well under several categories - Lend, For Sale, For Trade, Wanted, or Free. Once your items are entered, you have control over exactly who can see your items. Friends - items listed for friends can only be viewed by individuals you have "friended"
There are two types of communities, public and private. Public communities can be joined by anyone at any time. They usually center around a common interest or location. Private communities are joined by invitation only. As you can see, it is a pretty flexible tool. I found listing items pretty easy. At first, the browsing function didn't seem as intuitive as other sites I've seen, but I figured it out soon enough. Those on the TOS Crew created their own private community and we were able to see items listed by the other members. Once you find something you would like, your request can be submitted through the Lobster Network site. You can also send messages if you have questions about the item. With the exception of the added control on who sees your posting, the buy/sell/want features are similar to other sites . The member lists his or her item and those interested make contact through the system. Because it is a new website, the buying and selling feature is not as active as other sites, but that will change as membership grows. However, the Lobster Network feature that I found most unique is the virtual lending library of items available among a larger group of people. Once items for loan and listed and an exchange is agreed upon, Lobster Network helps make it a smooth transaction. When you loan an item out, the system will keep track of where your items went and allow you to make them available again when they return. It will also send out reminder notices to those who have your borrowed items. This addresses two major issues I have had in the past with loaning items out - forgetting who borrowed my item and the person who borrowed it forgetting they had it. I'll admit that I have a very selective list of people who I will let borrow my items. I have simply had too many things go missing. I also tend to not like to borrow a lot of items, either for fear of damaging it or simply because I like to own our items for the flexibility to use them whenever I want. Even though Lobster Network allows viewing of your inventory by just a select few, in my case it is almost easier to just call or send a quick email to those on my swap list to inquire about items. However, there are several specific circumstances where I can see real advantages to using Lobster Network as a lending library. As an example for the first case, I belong to an online community where many of the members enjoy courses by The Teaching Company. These courses are on the pricier side and not always available at libraries. Several members agreed to make the courses they owned available for loan, with the benefit of being able to borrow titles from other members. It took awhile to figure out how to share the inventory lists among each other. Utilizing something like Lobster Network would easily allow each member to better see the inventory of others, request items, and track the transaction without having to create a custom system. Homeschool groups would fall under the second case, as would other interest-based groups where similar items would be used among the group. I often have homeschooling items on my shelves that one child has moved beyond, but that I'm holding on to until the next child in line reaches that level. I also often have other homeschoolers ask if they can borrow an item for a short time just so they can see if it might work well for their family before making a purchase. I can see how this would also work with other interest-based groups, for example, photographers for equipment, backdrops, and props. Lastly, have you ever been looking for a tool for a project and wondered who in your neighborhood might have it sitting in his garage? Those expensive home projects could be much easier on the budget without needingi to rent or purchase costly tools. With the flexibility Lobster Network offers, I am sure there are many other uses I haven't thought of that would help save budgets, either through selling and buying used items or through sharing what we own. In the current economy, I think that is something we can all appreciate. In that same spirit, Lobster Network is a FREE to join, use, and enjoy. Visit the FAQ page on the website to find out more about the service or the registration page to join. This is my second title for review from Kregel Publications. You can read my first, which also includes some background on the company, here. This time around, I received a title from a series that I've heard about in the past, but had never read, Circle C Adventures by Susan K. Marlow. There are six titles in the Circle C Adventures series, which tell the tales of Andrea Carter, a spunky tomboy who lives on a cattle ranch near Fresno, California in the 1880s. I received Andrea Carter and the Trouble with Treasure for this review. Whenever I read a book from a series out of order, I'm always concerned that I'll be a bit lost in the storyline. While Trouble with Treasure referenced some previous adventures from other titles, this title is pretty much a stand-alone story. Even so, the very first page includes a letter from the main character telling a bit about the character's family and what has happened in the other titles. I immediately liked the character of Andrea, who goes by Andi, as she reminded me a bit of my own daughter. While Andi constantly falls into trouble at her cattle ranch in the 1800s - the spirited and adventurous tomboy reminded me quite a bit of my trouble-free, modern, suburbia young teen. In this particular title, Andi and a visiting out-of-town friend, Jenny, start their adventures off in the jail after getting caught by the new deputy horseplaying in town. After their quick release, the pair is looking forward to putting their troubles behind with a trip into the mountains with Andi's brother, Mitch, and friend, Cory. Little did they know more troubles were awaiting them! I don't want to give the story away, but Andi has much more to worry about in the mountains than she did sitting in a jail cell for a couple of hours. I would describe this as a light adventure story for tweens. It was wholesome, but not so much so that it doesn't include a good gun fight. I like that Andi certainly has faults, but is learning to deal with her quirks. She's a young girl that is growing into a young woman, but isn't quite ready for the leap. After her adventure in the mountains, Andi comes to realize that growing up might not be so bad after all. Maybe growing up wasn't such a bad idea, after all. She like the idea of being considered a sensible young woman - even if she'd been scared half to death at the time. I think my daughter, now 13, would have really liked this series around age 8 or 9. While she enjoyed the title, she tends to read more fantasy or science fiction with more complicated plots now. I also had my tween son, age 10, read the title. 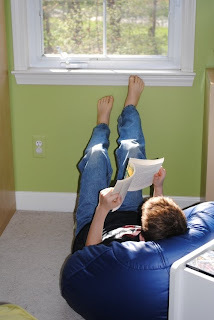 He read it rather quickly, so I know it was enjoyable enough, though not the typical type of book he would read. However, I think the Circle C Adventure series would be most appealing to young tween girls. While it is categorized as Christian fiction, it really is more just wholesome than overwhelmingly Christian. I think it would be enjoyable to non-Christian audiences as well. 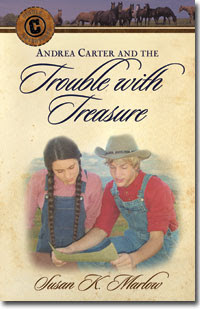 You can read an excerpt of Andrea Carter and the Trouble with Treasure to get a feel of the writing style. There is also a longer preview of another title in the series, Andrea Carter and the Family Secret, available here. Also of interest is the FREE 24-page Enrichment Guide for Trouble with Treasure. More excerpts, study guides, puzzles, and video clips are also available at the Circle C Adventures site. Readers will also enjoy following Andi on Andi's very own blog! Overall, this is a great wholesome series, particularly for young girls. Each title retails for $7.99 and can be purchased from Kregel Publications. 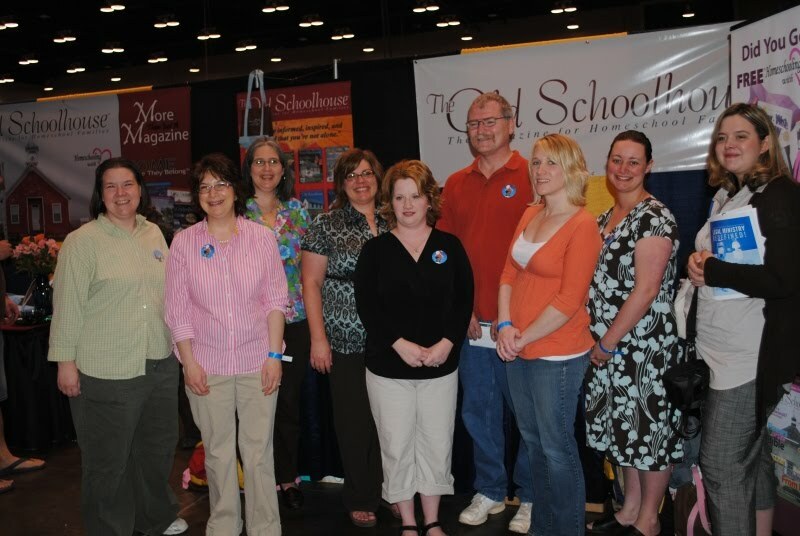 Be sure to visit the official TOS Homeschool Crew blog to read what other TOS Crew members thought. May. 'Tis the season of AP (Advanced Placement) exams. At risk of divulging too much about my sorry high school education, let me just say that I had no idea what AP exams were until I was already out of college. I've since made it a point over the last couple of years to educate myself on AP exams before my oldest reaches high school. If you are a bit fuzzy on the details, you may be interested in reading a previous post on AP Exams and Courses for Homeschoolers. I had been familiar with Cerebullum Corporation as a producer of the popular Standard Deviants educational program. These fun and thorough DVDs, described as "a cross between Sesame Street and Saturday Night Live" have been enjoyed in our home. However, I was not aware that this same company had another line of educational programs, Light Speed. Each member of the Crew received an Advanced Placement program DVD on various subjects from the Light Speed line. I received Light Speed Writing, which covers how to prepare for the AP* English Language & Composition exam. Light Speed Writing comes with two components, a digital workbook and a video program. The 1-hour long video program is broken into three sections: Taking the Test, Writing the Essays, 30 in 30. The Taking the Test section covers the basic format of the exam, how to prepare, and how to approach each question type. The Writing the Essays section covers...you guessed it...writing the essays! Explanation of the structure of an essay, how to improve essay writing, and the different types of writing are covered in this section. Lastly, the 30 in 30 section flies through 30 topics needed for the AP* English Language & Composition exam in 30 minutes. The included Digital Workbook is a PDF file of 20 pages. It includes handouts, viewing worksheets (to use while watching the DVD), activities, worksheets and a check your knowledge section. Viewing the below clip will give an idea of the presentation format used in all of the DVDs. As you can see, the topics are presented in a fun and light manner by young adults, rather than a droning instructor. While this program is certainly not a stand-alone exam preparation course, I felt it was a great supplemental resource to prepare for an AP exam. It is meant as a quick overview of what the student should have studied over the course of the year, with last minute tips and suggestions. I imagine it would help ease pre-exam jitters and serve as a refresher just prior to exam day. It might even be worthwhile to watch in the fall, before AP coursework is even started, to give the student an idea of where they should be at come May when the AP exams are administered. Regularly priced at $14.98, Light Speed Writing is currently on sale for $11.24, along with the other 31 titles in the Light Speed line. To purchase a Light Speed DVD or one from other educational series available, please visit the Cerebellum website. There are currently four Light Speed AP* preparation titles. All four titles were sent out to the Crew, so be sure to visit the TOS Homeschool Crew's official blog to read up on the other subject areas. Are you looking for a structured curriculum for your preschooler? Ideal Curriculum is a research-based for early kindergarten or preschool. I was provided with the first month of Ideal Curriculum's year-long monthly curriculum kits as a downloadable kit. Each month provides a full curriculum of reading, writing, and math based on a theme, the first month's theme being transportation. Click here for a list of the other themes available. Each kit has three sections covering three key areas, literacy, math, science/social studies, through daily lessons and activities. Teaching guides, workbooks and a music CD (or audio file) are provided for the theme. Suggestions for supplemental activities and related science, sight words and concepts coordinated with the print materials. Unfortunately, I am unable to share any personal experiences with this curriculum. We are well past the preschool stage and this isn't a product that we could actually use. Even so, when I did have preschoolers, I didn't actually use a structured curriculum. Instead, we read books, went on field trips, and played. While a structured preschool curriculum doesn't exactly fit in with my style of homeschooling in the early years, this sort of product may fit in well with a homeschooling preschool co-op, daycare providers, or anyone looking for a bit of structure for the younger ages. Monthly kits cost $30 for a downloadable version or $55 for a print version. There is also an additional $7.50 for each additional child for the print version. Discounts are offered when purchasing more than one month at a time. Click here to see more about the various package prices. You can try it out with a free 1-week of Ideal's curriculum by signing up for their newsletter. During the month of May, readers can get 10% off on their first order of any product using the discount code welovekids. Getting ready for next school year? 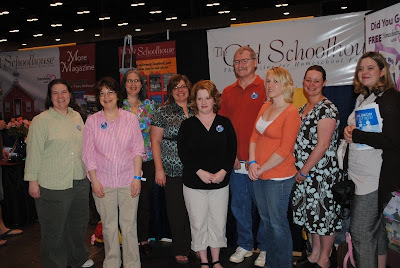 If you're researching or buying homeschool curriculum, you have to check out the Vendor Hall at the Schoolhouse Expo! It's open to everyone. Browse through companies such as Rainbow Resource, WriteShop, Apologia, Latin Road/Phonics Road, Multiplication Shake, Go Phonics, and MANY MORE! Latin Road/Phonics Road has freebies in their booth. Rainbow Resource has a free shipping offer. Spears Art Studio has a free CD. Real Science by Gravitas has a 25% discount coupon. There is just so much to see. Stop by and meet the virtual hostess from each company, browse their selection, and look for "conference specials". I've talked before about the benefits of having children involved in theater. For my family, it has served my very different children well in helping them grow. My daughter is very outgoing and just loves theater. It gives her a creative outlet and an appropriate way to shine - and project that voice, I might add. We don't have indoor and outdoor voices in our house. We have indoor and theater voices. For my son, who is a bit quieter, it gives him a structured and safe way to step out there. It works on his public speaking skills and gives him practice on how to effectively communicate. For both of them, the opportunity to work as a team, together as a cast, has been a great experience that will carry over to other areas. We just finished our fourth annual production, Nicholas Nickleby, with Homeschoolers on Stage, under the direction of my dear friend, Katy. This is my daughter's seventh production overall; she's done two other productions with other groups. This makes for the sixth production for my son, who also performed with my daughter with other groups. 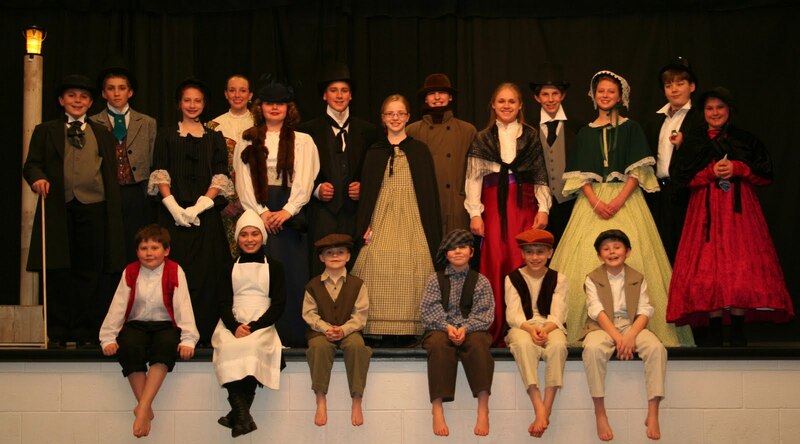 Of course, even though theater productions are hard work and a learning experience, they are also just plain fun! This year brought about some extra challenges. Dickens' Nicolas Nickleby wasn't a story with which most of the kids were familiar and they started off by watching a DVD of the 2002 movie starring Jamie Bell and Charlie Hunnam. They learned their lines quickly, but getting the hang of a British accent was more difficult for some. Also new this year was that one of the cast members completely designed the set to earn a badge for Boy Scouts. The costumes this year were quite a challenge, since most cast members had multiple roles. I lucked out in that my son played just one role, Smike. Even those this was a smaller part as far as lines, Smike is a main character and a dual role wasn't possible because of the amount of time Smike was on stage. His costume was fairly easy and I put it together inexpensively with borrowed items, old costume pieces, and selections from the Salvation Army. My daughter played both Fanny and Mrs. Crummles. Mrs. Crummles' costume was put together with a skirt, blouse, and shawl from the Salvation Army, and an antique hat I already owned. I made the sash (bright purple, though you can't see in the pic) with fabric from Walmart at $1/yard! Fanny was a bit more difficult and pricey, but I found a great deal on eBay. The costume suited the character perfectly. One of my roles as a theater mom is dealing with hair. 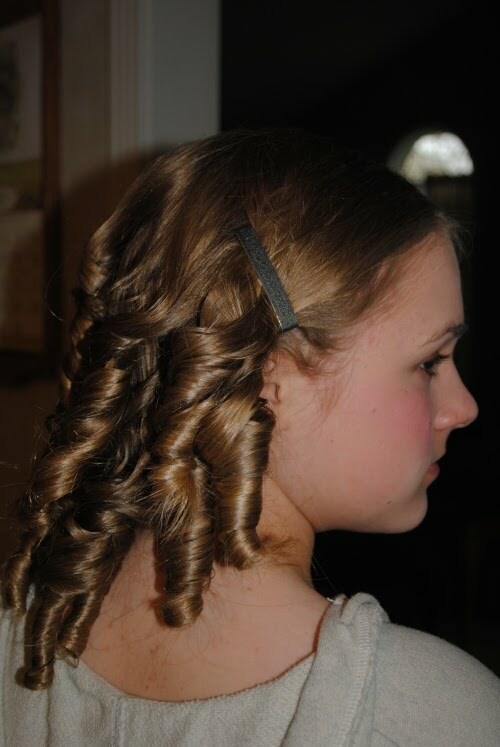 Making stick straight hair curl is no easy task. After several productions, I think I've almost perfected my method, which involves lots of hairspray and stick hot rollers. 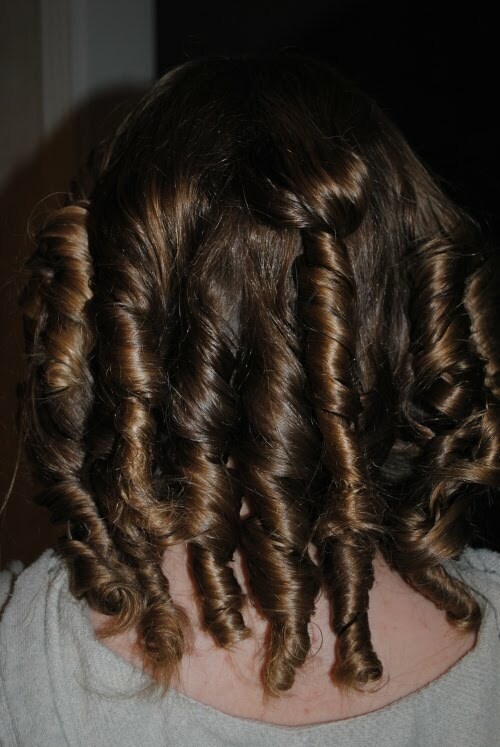 Even though the curls slowly loosen throughout the production, there are still plenty left when all is said and done. Everyone was both excited and sad to see the production come to an end after a matinee and two evening performances for family, friends, and the community. How I wish I knew what I know now concerning health and natural remedies when my kids were younger. Our early days were filled with doctor's visits and antibiotics. If only I had known how to boost the immune system naturally, before a virus could really take hold and cause problems. A little education goes a long way. My kids haven't been sick enough to go to the doctor in a long time simply from few little preventive steps whenever I see signs of illness. There is so much out there I don't know, though, and I'm always being introduced to new resources and products, such as Beeyoutiful. Beeyoutiful sells a variety of natural health products for men, women, and children. Members of the TOS Crew were offered a choice from a selection of products to review. I selected Berry Well, a natural immune booster. 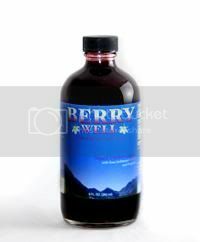 Berry Well is an herbal dietary supplement designed to boost the immune system. 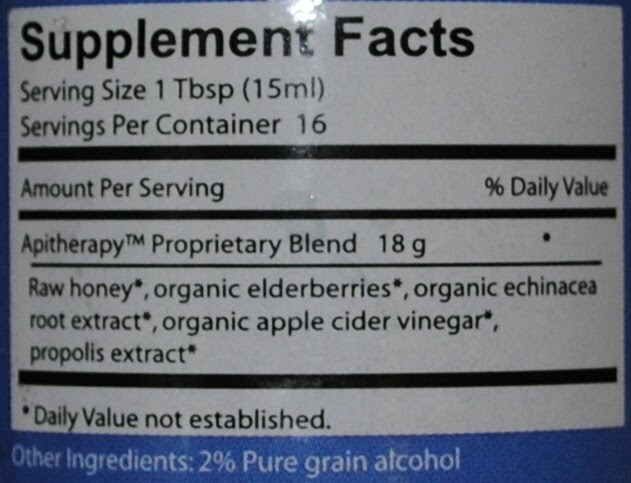 See below for a picture of the label with ingredients as it appears on the bottle. It is meant for ages 2-adult to take at the first sign of illness, or more regularly for general immune system maintenance. Our family has used elderberries to fight off viruses before, but never in a syrup form. 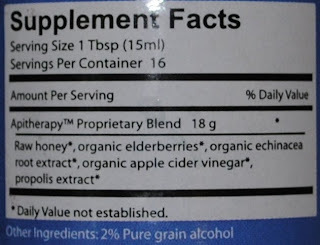 I had also heard of the benefits of honey, echinacea and apple cider vinegar, but I've never used these ingredients in one concoction. My Berry Well arrived at a very appropriate time. My daughter had the beginnings of a cold and was just three days away from traveling across the country by plane to Colorado. This time of the year she is prone to barky coughs that threaten to drop to the lungs and develop into bronchitis, which was the last thing she needed when away from home for several days. I started her on Berry Well immediately. The label did not indicate how often to take the product, but the website indicated "every 3 hours as needed". I initially started with less frequency, but increased the number of dosages after I visited the website. There are 16 servings in the bottle. By the time of the flight for her trip, my daughter had consumed almost the entire bottle. Before I share our results, please understand that I am not a medical doctor and our experiences our purely anecdotal. We have not used this product with any consistency nor under a variety of circumstances to determine its effectiveness. First of all, many may be wondering how this syrup tastes. Of course, it isn't really about the taste, but if you can't get it down your children (or you! ), it can't really do what it is meant to do. It can be taken straight from a spoon or mixed with water. We took it straight from the spoon. The consistency was a bit thicker than a cough syrup. I wouldn't call the taste yummy, but it isn't awful either. I personally didn't care for the hint of the apple cider vinegar taste, but my daughter didn't complain. As far as how it worked, it is hard to say. Her cold did not worsen and started to improve slight. She still had the sniffles when she boarded her plane to Colorado. Since the recirculating air in a plane full of people can be a germ-fest, I was a bit concerned. When I picked her up three days later, I noticed her cough was back and she had quite a bark. I wasn't surprised, since she left home sniffling and her event in Colorado kept her up late most nights. I was considering a trip to the doctor's office next day before it turned into bronchitis. However, the next day, she didn't sound as bad. She continued to improve over the next few days after getting more rest. Berry Well may have boosted my daughter's immunity enough to keep her out of the doctor's office, but it really is hard to say. I would, however, give this remedy a try again as it certainly didn't seem to hurt. Berry Well sells for $18 a bottle. You can find this product, as well as variety of other products for healthy living, at the Beeyoutiful website. This post is a bit delayed, but things have been crazy since my return from the convention. I thought I'd share some highlights and purchases I made while in Cincinnati. First of all, just going is a highlight. I don't get away very often and it is sort of a mom's weekend for me. My friend, Katy, and I usually gab all the way there and the 4-hour drive doesn't seem too long. The year we arrived a couple of hours before the registration opened and avoided all lines. We were able to have a nice lunch before the start, which was awesome because we really didn't have time for dinner. One of the highlights was meeting some of the ladies (and gent) on the TOS Crew. Even though this was the first time I had met most of them, I really do feel like I know them personally already through interacting with them online all year. As far as purchases, I didn't do all that bad. I only had one unintended purchase and it was actually something that I almost purchased last year. I figured if I still wanted it after a whole year, it was a justified purchase! I was lucky enough to have my daughter's chemistry text for next year, which I had already picked up inexpensively used . However, I still needed the lab kit. She also requested the audio CD of the text. I'm not sure why, since she didn't use it for her biology last year (and it wasn't available for her marine biology course this year). Either way, I wasn't going to decline a request for an audio of a text! My most expensive purchase this year was the One Year Adventure Novel. I have been wanting this item for my daughter, who loves to write, since the Crew reviewed it last year (and I was sadly not on the list for it!). There was a convention special that saved me about $20 when all was said and done after taxes, so I went ahead and splurged. My daughter is looking forward to going through the program. I hope to get her registered for the forum soon and have her work on it some over the summer. My son will be finishing up his Math U See book soon, and I purchased the next level up and saved some on shipping. I already have the DVD and just needed the student workbook. Math U See is really working out for him and we'll continue using it at least until algebra. My only unintended purchase was the Summit Ministries Lecture Series. I just could not pass this deal up. It included 150 hour-long lectures by a variety of speakers on some pretty deep topics. I really enjoyed listening to John Stonestreet's sessions both this year and last. Eventually, I'd like my kids to attend the Summit Student Worldview Conference, but my oldest still has a few years before she meets the age requirement. After talking to one of the young ladies and finding out that a lot of the material on the CD is the same from the conference, I was sold. Besides, they were running a convention at half off the website price. I'm a sucker for sales. I decided to visit the booth of Virginia Soaps & Scents, a vendor that sent their products to the TOS Crew review team this year. They are such nice people, very down to earth. I knew I'd be walking away with some goodies. They have a new hair conditioning bar that I intend to send with my daughter to camp this year. I also purchased another all-in-one bar, in the Waltzing Matilda scent, and a laundry soap bar. Lastly, I always bring something home for my kids. My son loved his "Caution: Unsocialized Homeschooler" shirt. 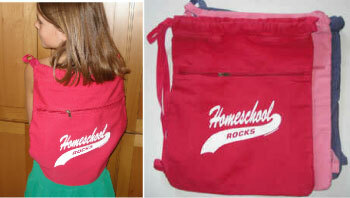 Instead of a shirt, I opted to buy my daughter a bag this year (that is not her in the pic). Last year she attended with me and selected her own shirt, but this year she had another event to attend. I figured the bag would be a safer choice. Of course, I haven't mentioned any of the speakers yet. I couldn't attend nearly all of the ones I wanted to this year. There were so many scheduled in the same time slot. I think John Stonestreet was my one of my favorites this year, along with Andrew Pudewa. I had heard both of these men speak before, but the topics were new. However, my absolute favorite was Tim Hawkins. I laughed all the way through his performance. I knew he was going to be funny, but I really had no clue how much my cheeks were going to hurt from smiling by the time his show was over. If you get a chance to see him, definitely do. He sure has talent! I understand that the organizers of this event are expanding to other areas next year and already are working on the 2011 conventions. I already have the Cincinnati dates on my calendar!